Did you know that tens of thousands of new cases of oral cancer are diagnosed every year? What’s worse is that a significant percentage of these patients will not survive more than five years past this point. 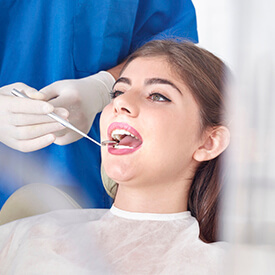 Thankfully, there’s a silver lining – oral cancer can be successfully identified in its earliest stages, and your dental team at Roselle Park Dental & Implants is here to help with routine screenings. Please contact us today in Roselle Park, NJ if you are ready to schedule your first appointment with one of our doctors, or if you have any questions. Red or white patches that appear on the tongue or the oral tissues. Suspicious oral sores that bleed very easily or are suspiciously slow to heal over time. Gray, hardened lesions that can appear in any area within the mouth. Lumps or thickened tissues in the throat or mouth. Oral cancer screenings are simple and painless for patients. One of our doctors will carefully feel your face and neck for any tell-tale indications that need further attention, and they will review the mouth as well to determine whether any of the symptoms listed above are present. If we locate any causes of concern, a biopsy will need to be arranged so that the tissue can be tested and a more solid diagnosis can be procured. Please remember that the earlier oral cancer is located, the better chances are that you will experience a safe and full recovery from the condition with the help of proper treatment.